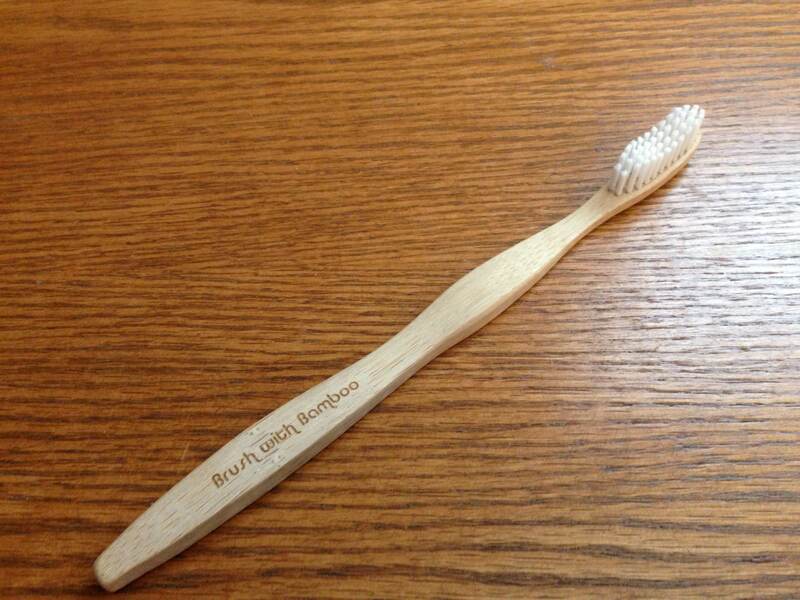 Brush with Bamboo is an idea that instead of using plastic handled toothbrushes we should be using ones made from bamboo. While it’s been years since I’ve used a full plastic toothbrush (I use a rechargeable electric one and recycle the small heads) I was sent one for review and gave it a go. It’s a pretty great toothbrush, it’s comfortable and the bristles were softer (but not too soft) that I was used to. I thought the wood would feel odd when wet and in my mouth, but I didn’t notice anything. Toothpaste foamed up great and I’ve been using it for a few days with no problem. Dentists recommend replacing your toothbrush every three months and I can’t see this bamboo toothbrush having any problems with that. Over 2 billion toothbrushes are apparently send to landfill every year. While most could be recycled (and even turned into new toothbrushes) most aren’t. Bamboo on the other hand is one of the fastest growing plants on earth (up to 4 feet a day!) and is renewable. It also is naturally antifungal so protects itself against mold. The bristles are BPA free nylon and can be recycled if removed from the handle. There are also instructions on the website about taking care of it. You can also buy it from their shop of course. It seems a great idea, and the cost is not much more than a plastic toothbrush (less in some cases) so should make a great alternative for those Eco-conscious teeth cleaners out there! While I’ve reviewed Bulldog’s moisturiser before (the Fairtrade version, the sensitive version and the original Hydrate version), it’s time to revisit it. Why? Well not only is it growing in popularity and available in more and more outlets, but it’s got a fresh new look and may have changed in the two years since the last review. As I get sent a lot of free grooming products I haven’t bought one in a while but if I did I would seriously give Bulldog a go. Just opening the bottle reminds me of why I liked it so much in the other reviews, it has a lovely fresh smell which I’m told is now throughout it’s whole range – I’ll let you know what I think of the others soon. The moisturiser contains eight essential oils, green tea, green algae, something called Konjac Mannan and vitamin E and doesn’t contain things like parabens, sodium laureth sulfate or synthetic fragrances. You can find out more about its ingredients at Meet the Bulldog. It’s actually a little oiler on first use than I remember and I was worried that would be transferred to the skin but I needn’t have, it rubs in nicely with no oily residue. You don’t need to use too much of it and my skin lapped it up. I really like it. Looking back at my other reviews, there’s not much more to add apart from suggest you should try it out yourself. you can now but it directly from Bulldog for £6.99 for a 100ml bottle or it’s available in supermarkets. Joel’s previously reviewed Bulldog’s shave gel and the sensitive version and loved them both, in fact so did his wife. On him, she didn’t use it herself. As he mentioned in them though he reviewed them as I don’t shave, but I took one for the cause and gave it a go – I need to shave sometime. And although, unlike the others, this is a clear gel rather than more like a cream, I loved it too. It’s smooth and creamy and that means the razor glides smoothly over the skin without getting the blade gummed up. And it still smells lovely too. I’m pleased to see this new Fairtrade version, although not all the ingredients are Fairtrade, it’s a step in the right direction and is BUAV approved. With eight essential oils, no ingredients come from animal sources, there are no paraben, sodium laureth sulfate, artificial colours or synthetic fragrances. More details on the whole list of ingredients are published on the maker’s website, www.meetthebulldog.com. It’s formulated using sesame seed oil and green tea which aims to sooth your skin and I think it helped me at least. You can find Bulldog at supermarkets and online at shops like Big Green Smile for £4.39. I’ve reviewed a number of Bulldog products before, including to versions of its moisturiser – the hydrating version and the sensitive version. This is the new Fairtrade version and is still ‘Natural Grooming’ but is called ‘Eco-system: Hydrating’. And it’s like coming back to an old friend. I’ve commented on the scent being a bit strong when you first use it but I didn’t notice it and in fact it was like using an old friend. Since I’ve last reviewed it this old friend has become very popular, is available in a lot of mainstream shops and featured in magazines. So I’m pleased to see this new Fairtrade version, although not all the ingredients are Fairtrade, it’s a step in the right direction and is BUAV approved. With eight essential oils, no ingredients come from animal sources, there are no paraben, sodium laureth sulfate, artificial colours or synthetic fragrances. More details on the whole list of ingredients are published on the maker’s website, www.meetthebulldog.com. The product itself is of Bulldog’s usual high quality, I’ve enjoyed using it. As described in the previous reviews I have a short beard and often find thick moisturisers get stuck in it and turn my beard white. This however, while thick soaks nicely into my skin and I feel refreshed after using it. Bulldog Natural Grooming Moisturiser – Fairtrade version is available from major retail chains and online at places like Big Green Smile for £7.49. We’ve reviewed a few different eco-friendly toothpastes here at Life Goggles, the Optima Aloe Dent one, Aloe Dent Whitening and Trader Joe’s All Natural Peppermint toothpaste. And the one thing they have in common is they don’t taste like normal toothpaste – not as minty or ‘normal’ like you’re used to. So I didn’t expect this JASON Nutrismile Toothpaste to be any different. And it wasn’t. But at least it doesn’t even claim to be minty, it has something called Ester-C instead which is there to reinforce tooth enamel and defend against tooth decay. It also has three natural whiteners to polish and whiten teeth, natural anti-bacterial perilla seed extract which helps block the formation of sugar acids and micro-organisms that form tartar on teeth. Or so it says anyway. As with the other toothpastes we’ve reviewed it doesn’t contain fluoride which while good for your teeth, isn’t great for the environment. So despite the weird taste, I’ve been using it for a few weeks and not only have grown to put up with in, I’ve grown to like it and I like the toothpaste itself. It foams up nicely like ‘normal’ toothpastes, in fact it’s quite a thick foam so you don’t have to use a great deal of it to clean your teeth. If you’re looking for an eco-friendly toothpaste you can’t go far wrong with this one. JASON Nutrismile Toothpaste costs £4.84 from Big Green Smile. “Until I was pregnant with my son Harry, I had never realised just how many baby products were available. I was obviously aware that there were several makes of pushchairs and cots to choose from but I never thought I’d find myself dithering over which bath products to buy for my unborn baby but that’s exactly what I was doing the month prior to Harry’s arrival. “I ended up selecting the Little Me Organics Sleepy Head Bath Milk as it contains organic ingredients and more importantly doesn’t contain either of the controversial ingredients used in many toiletries like parabens and sodium lauryl sulphate. “I believe this product has magical properties, as it never fails to calm my frazzled nerves at the end of another fraught day. As soon as the bath milk is poured under the running tap, the dill and lavender scent is released into the bathroom and I immediately begin to relax. Little Me Organics Sleepy Head Bath Milk costs around £4 for a 300ml bottle and is available instore and online. “I was thrilled to be asked to review the Method Squeaky Green Baby Bubble Bath as I’m keen to use the best products I can when bathing my six month old son, Harry and as you’d expect from Method, this bubble bath doesn’t contain any phthalates, parabens, SLS/SLES, numbing agents or animal by-products and is derived from 99% natural ingredients. “The bubble bath come in a very funky, penguin shaped bottle, which although clearly aimed at children is still very stylish (for a bubble bath bottle). The product is scented with mallow and rice milk and left Harry smelling good enough to eat. In fact I liked the smell so much that I’ve been using it in my bath. “My only disappointment was that despite several attempts I was unable to produce any bubbles so perhaps it’s should be labelled as a bath soak rather than a bubble bath. As Harry is a little too young to appreciate bubbles then this wasn’t really a problem and if bubbles mean chemicals I’d rather he forgo them. Method Squeaky Green Baby Bubble Bath costs around £5 and is available from places like Big Green Smile and other online retailers.